On 26 March 2018, the Faculty of Education (FEd) of the University of the Philippines Open University (UPOU) conducted its 5th EDUKussion Forum titled “Social Studies for Effective Citizenship Education:Japan Perspectives” held at Centennial Center for Digital Learning (CCDL), UPOU Headquarters, Los Baños, Laguna. 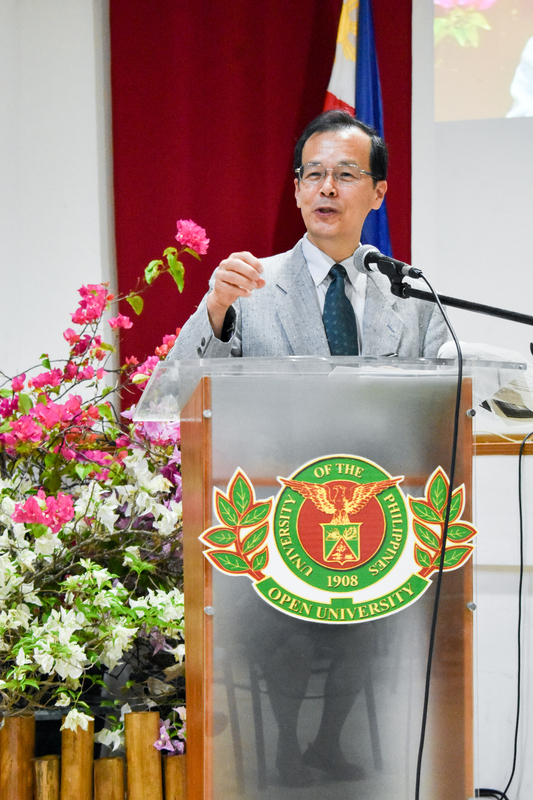 Prof. Tomoyuki Kobara, Professor, Faculty of Human Cultures and Sciences, Fukuyama University and Professor Emeritus, Hiroshima University, served as the resource person for the event which is attended by students and teachers from the Basic Education Sector and Higher Education Institutions (HEIs) within Laguna. Dr. Joanne V. Serrano, Director of Information Office and Multimedia Center, facilitated the forum. Prof. Tomoyuki Kobara discusses Japan perspectives on Social Studies as citizenship education. In her opening message, Dr. Melinda dela Peña Bandalaria, Chancellor of UPOU, noted that the Japan perspectives can serve as a template or guide in integrating the Filipino perspective in the Social Studies courses. She asserted that effective citizenship is something that should be integrated into the various subject areas not only just in Social Studies. “In order for you to be a good citizen, you have to participate in the matters of the society,” she remarked. In his lecture, Prof. Kobara emphasized that one of the role of Social Studies is to reinforce citizenship education, an education not based on memorized knowledge, but on the development of a citizen and promoting a democratic and peaceful society. To affirm this, Prof. Kobara shared an example of how effective citizenship education is being implemented in Japan. The case focused on the Onagawa Junior High School students who generated practices and measures of ensuring the safety of the Onagawa town, following the aftermath of the magnitude 8.9-earthquake that hit Japan on 2011 which brought numerous casualties and millions worth of damage to Japan, especially to the Miyagi prefecture. To explain how the Japanese Social Studies has been established as citizenship education, Prof. Kobara gave a brief overview of the history of post-war guidelines in teaching Social Studies in Japan. He tackled the objectives of Japanese Social Studies both in elementary and secondary schools which emphasize the ultimate goal of nurturing civic qualities among the students. He also shared the structure of Social Studies being taught in schools in Japan and discussed pedagogy for citizenship education as seen in exemplary Social Studies lessons. After his lecture, the participants actively engaged in the discussion. One of the questions raised pertains to the manner of teaching Social Studies during the Sakoku years, the long period of national isolation, experienced by Japan in 17th to 19th century. The participants also shared their insights and realizations. An online participant commented that the relevance of social studies education lies not only on merely imparting knowledge, but on being a platform to instill essential values in becoming a good citizen of the nation. Another participant pointed out the lessons he took from the lecture such as the integrated approach in social studies and strong emphasis on geography in terms of teaching Social Studies. He hoped that the teaching of geography can be further strengthened in the Philippine education. The forum ended with an emphasis from Dr. Ricardo Bagarinao, Dean of FEd, on molding an empowered citizen of a nation by connecting the knowledge and skills gained inside the classroom to the practice outside of its traditional set-up. He encouraged the participants to reflect on how and why they teach Social Studies and imparted the challenge of teaching the students to contribute to national development. “This task is very challenging, but we have to, for the nation”, he concluded.